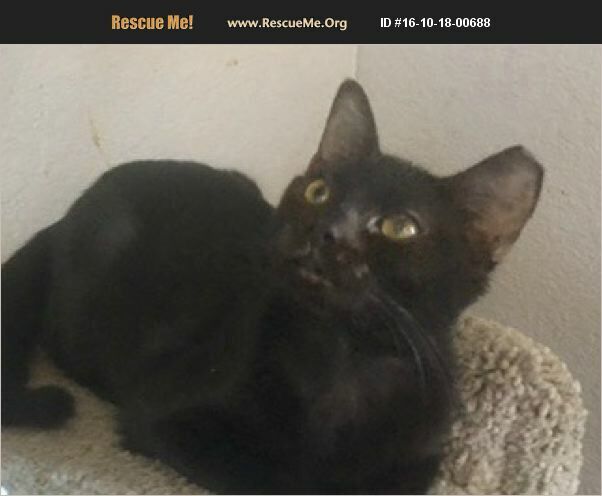 My name is Molly, and I am such a sweet, loving, outgoing Bombay/ black domestic short hair mix girl who was born in March 2016. I have the Bombay mix's soft, sleek, and gleaming coat that is like black patent leather as well as dreamy round copper-penny eyes. I love to cuddle with my foster meowmy, which is not surprising since Bombay mixes are sometimes called Velcro kitties because they are so sociable and like people so much. I love to play with my foster kitten mates, balls with bells, wand toys, and catnip mice. I had a rough start in life. You see, I was trapped and taken to the shelter as a feral kitten to be spayed and released where I was found. However, they quickly found out that I was too friendly and sociable to be feral. My ear had already been tipped (the universal sign of a 'fixed' feral cat) before my future foster meowmy saw me and realized what a sweet girl I was. It didn't take her long to decide that I deserved the chance for a real home - one that is safe and sound instead of my living on the streets fending for myself again. I will always be grateful that Buster's Friends gave me that chance! Since I am great around the other kitties and dogs in my foster home and love to hang out with people, I would fit into many family situations. Won't you arrange to meet me? I know that I'm an adorable chip of onyx, so how can you resist giving me my lifetime home? Please don't be superstitious of black cats! Buster's Friends makes a concerted effort to rescue black cats and kittens from shelters because they are five times more likely to be euthanized than any other color of cat. However, many people who have had a black or Bombay mix cat before end up adopting another one because they seem to have such wonderful personalities and are emotionally stable and well balanced. To find out more about Bombay mixes, watch the 2-3 minute You Tube video that appeared on Animal Planet by googling 'Cats 101 Bombay. 'Molly is updated on shots, spayed, dewormed, microchipped, FIV/ FeLV negative, and ready for her indoor-only home. No de-clawing permitted. Her adoption fee is $100, cash or check payable to Buster's Friends. Please click the contact button if you are interested in Molly, and we can let you know exactly where you can meet her. To make the process more efficient, download the adoption application at http://www.bustersfriends.org/catadoptionapplication.shtml. First save and then open it; then you can print it and fill it out.